Are Adidas Three Stripes In Wyoming’s Future? The current uniform provider for the University of Wyoming football and men’s basketball is Nike. That deal was signed in 2013 and Nike became the uniform provider in June of 2014 with a contract that runs through May of 2018. While news on a new uniform provider has been quiet as of now, we now have a clue on who will be providing the Pokes their brown & gold in 2018 and beyond. The fall 2018 Adidas team catalog is out and includes the map seen below. 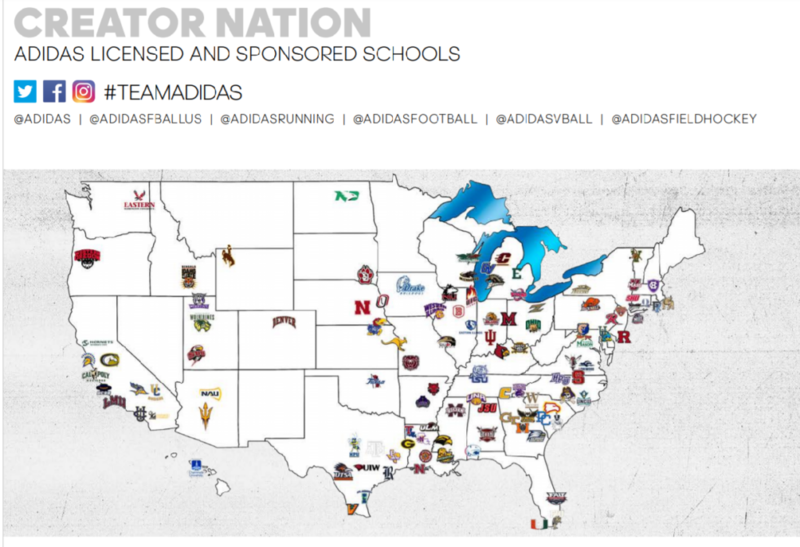 This graphic clearly shows that Wyoming is among the “Adidas licensed and sponsored schools” which the catalog says is effective on June 1, 2018. There is a major problem though, they have the University located somewhere in the vicinity of Jackson or Yellowstone which is off by about 300 miles as the crow flies. This will all be forgiven though if they can give the Pokes a nice set of brown and gold threads and not use black or shades of gray for a good number of team and fan apparel as Nike did. We don’t know when this potential move will be announced but I would guess sometime after spring football when Wyoming football hangs up their Nike gear. Would you be in favor of a switch to Adidas from Nike? Have your say in our poll below! I’m for the one that gives UW the most value. Whichever company is chosen I believe Coach Bohl will insist on a basic design. We weren’t Oregon even with Nike.